hones, tablets, streaming boxes, smart televisions, desktops, laptops and more provide consumers a wealth of opportunities to go online, resulting in increasingly complex and individualized habits for content consumption. 15% 36% 28% How often do you watch TV and use a digital device simultaneously? In what ways have you used your digital device to engage with the TV content you were watching? In what ways have you used your digital device to engage with audio content you were listening to? The Ben Lomand Connection is a bimonthly newsletter published by Ben Lomand Connect, © 2019. It is distributed without charge to all member/owners of the cooperative. 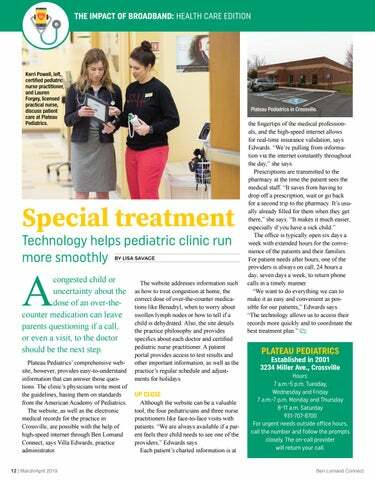 On the Cover: Dr. Lauren FoxBergvin is one of four pediatricians at Plateau Pediatrics in Crossville, where technology makes a difference. See story Page 12. A Star is Born Bradley Cooper’s directorial debut features Lady Gaga in a dramatic musical love story. Darryl Gribble, Jeff Carter and Tommy Brown are among the employees who conducted the tour. YOUTH LEADERSHIP The 2019 Youth Leadership classes at Warren and Van Buren counties visited Ben Lomand Connect’s plant operations building. The students visited the Engineering, Construction and Installation/Repair departments, along with the warehouse, to learn about those jobs and how they relate to fiber deployment in Ben Lomand Connect’s service territory and beyond. Bohemian Rhapsody A foot-stomping bio-pic about the founding of the rock band Queen and legendary vocalist Freddie Mercury. Revised drive-thru hours The drive-thru window hours have been revised at all cooperative offices. The drivethrus are open from 7:30 a.m. to 5 p.m. Monday through Friday, closed Saturdays. Lobby hours remain 8 a.m. to 5 p.m. Monday through Friday. Customers may call the Network Support Center 24 hours a day at 1-855-800-3002 or 611 from any Ben Lomand phone. We offer several payment options for your convenience: Ben Lomand offices at 1-800-974-7779, automated payment system at 1-855-874-5356, online at benlomandconnect.com, bank draft or recurring debit or credit card charges. rick-lined streets, century-old homes along avenues fringed with oldgrowth trees, cute shops, restaurants and heavenly bakeries all make Laurel, Mississippi, a charming Southern town. In its heyday, it was the lumber capital of the country. Somewhere in the 1980s, however, it became little more than a whistle-stop for people traveling between Birmingham and New Orleans. But much changed when Erin Napier and her husband, Ben, returned to her hometown. They are the stars of the HGTV show “Home Town,” now in its third season. And what they’ve done to bring Laurel back is nothing short of amazing. The show’s premise is this: Take an old Laurel home in need of restoration and bring it back to life with a bit of paint, some woodwork, drywall and lots of ingenuity. They turn a house in need of updates into a neighborhood showplace. The success of “Home Town” brings people not only from around the country but also from around the world to Laurel. Visitors find renovated houses and some of the show’s hot spots, including Laurel Mercantile Co. and The Scotsman General Store, both owned by the Napiers. Another stop is Pearl’s, a lunch-only establishment highlighted in the show’s first season. It’s not uncommon to see a line at the restaurant, which features black-eyed peas and fried chicken. 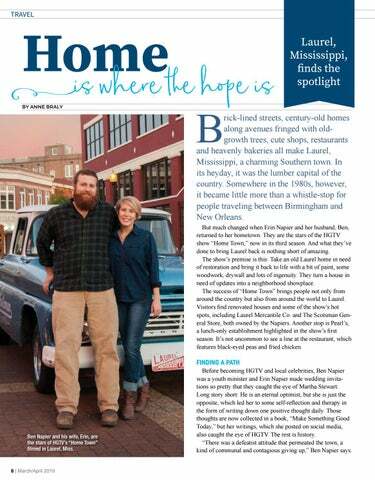 Ben Napier and his wife, Erin, are the stars of HGTV’s “Home Town” filmed in Laurel, Miss. Before becoming HGTV and local celebrities, Ben Napier was a youth minister and Erin Napier made wedding invitations so pretty that they caught the eye of Martha Stewart. Long story short: He is an eternal optimist, but she is just the opposite, which led her to some self-reflection and therapy in the form of writing down one positive thought daily. Those thoughts are now collected in a book, “Make Something Good Today,” but her writings, which she posted on social media, also caught the eye of HGTV. The rest is history. “There was a defeatist attitude that permeated the town, a kind of communal and contagious giving up,” Ben Napier says. 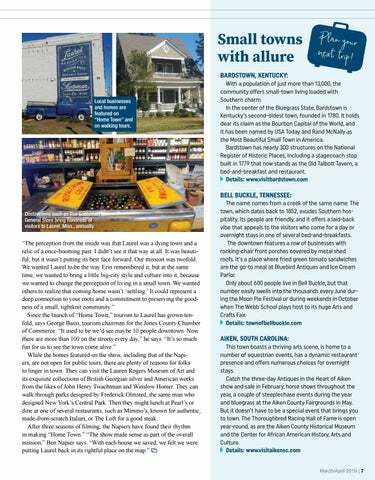 Local businesses and homes are featured on “Home Town” and on walking tours. P lan your next trip! BELL BUCKLE, TENNESSEE: Destinations such as The Scotsman General Store bring hundreds of visitors to Laurel, Miss., annually. Warren County High School senior Reagan Whitlock assists students with homework. From left, Kaden Pascal, Whitlock, Mia Pascal and Rosa Vanloo study after school. yler Keener struggled in math, barely getting by when he started at Kids of the Community’s after-school program several years ago. But help with homework and one-on-one tutoring in math through the program have made a big difference for the Warren County High School senior. A donated building on Cadillac Lane in McMinnville is home to Kids of the Community. FUN AND GAMES Christie Allison, a volunteer with Kids of the Community since its beginning, is director of tutoring. 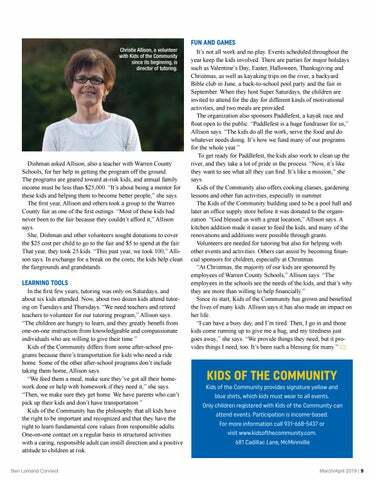 Dishman asked Allison, also a teacher with Warren County Schools, for her help in getting the program off the ground. The programs are geared toward at-risk kids, and annual family income must be less than $25,000. “It’s about being a mentor for these kids and helping them to become better people,” she says. The first year, Allison and others took a group to the Warren County fair as one of the first outings. “Most of these kids had never been to the fair because they couldn’t afford it,” Allison says. She, Dishman and other volunteers sought donations to cover the $25 cost per child to go to the fair and $5 to spend at the fair. That year, they took 25 kids. “This past year, we took 100,” Allison says. In exchange for a break on the costs, the kids help clean the fairgrounds and grandstands. n rural communities, the local pharmacy is often more than just a place to pick up over-the-counter cold medicine and fill prescriptions. It’s the first stop for all things health care. Photo courtesy of Mandye Green. Cole Sandlin, left, works with the telemedicine kiosk installed in 2017 at his pharmacy in Hamilton, Alabama, as part of a pilot program with American Well. A SMARTER APPROACH That gap between health care access in rural and urban areas is a challenge not just in Hamilton but throughout the country — a problem largely brought on by the rapid advancement of medical technology over the last century. Photo courtesy of American Well. Companies such as American Well are developing technology that can connect patients to doctors — whether at a clinic or in their home. Did you know? Kentucky and Tennessee passed telehealth parity laws in 2000 and 2016, respectively, that require private insurance companies to reimburse telehealth services at comparable rates to in-person care. In 2016, Alabama also enacted a partial parity law to cover remote mental health services. In South Carolina, live video consultations are covered by Medicaid in some circumstances, while Kentucky Medicaid recipients can be reimbursed for video consultations and teleradiology. To learn more about telehealth reimbursement in your state, visit cchpca.org. Kerri Powell, left, certified pediatric nurse practitioner, and Lauren Forgey, licensed practical nurse, discuss patient care at Plateau Pediatrics. congested child or uncertainty about the dose of an over-thecounter medication can leave parents questioning if a call, or even a visit, to the doctor should be the next step. Plateau Pediatrics’ comprehensive website, however, provides easy-to-understand information that can answer those questions. The clinic’s physicians write most of the guidelines, basing them on standards from the American Academy of Pediatrics. 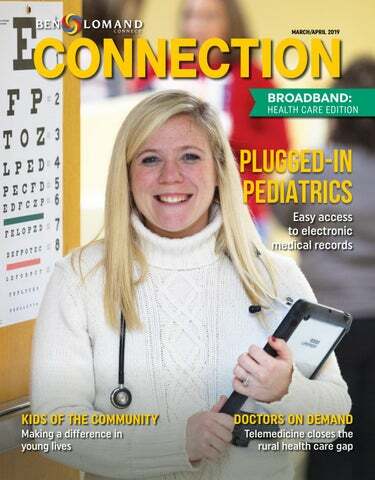 The website, as well as the electronic medical records for the practice in Crossville, are possible with the help of high-speed internet through Ben Lomand Connect, says Villa Edwards, practice administrator. The website addresses information such as how to treat congestion at home, the correct dose of over-the-counter medications like Benadryl, when to worry about swollen lymph nodes or how to tell if a child is dehydrated. Also, the site details the practice philosophy and provides specifics about each doctor and certified pediatric nurse practitioner. A patient portal provides access to test results and other important information, as well as the practice’s regular schedule and adjustments for holidays. Established in 2001 3234 Miller Ave., Crossville Hours: 7 a.m.-5 p.m. Tuesday, Wednesday and Friday 7 a.m.-7 p.m. Monday and Thursday 8-11 a.m. Saturday 931-707-8700 For urgent needs outside office hours, call the number and follow the prompts closely. The on-call provider will return your call. 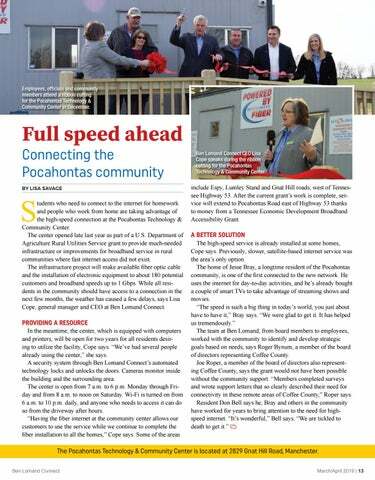 Employees, officials and community members attend a ribbon cutting for the Pocahontas Technology & Community Center in December. tudents who need to connect to the internet for homework and people who work from home are taking advantage of the high-speed connection at the Pocahontas Technology & Community Center. The center opened late last year as part of a U.S. Department of Agriculture Rural Utilities Service grant to provide much-needed infrastructure or improvements for broadband service in rural communities where fast internet access did not exist. The infrastructure project will make available fiber optic cable and the installation of electronic equipment to about 180 potential customers and broadband speeds up to 1 Gbps. 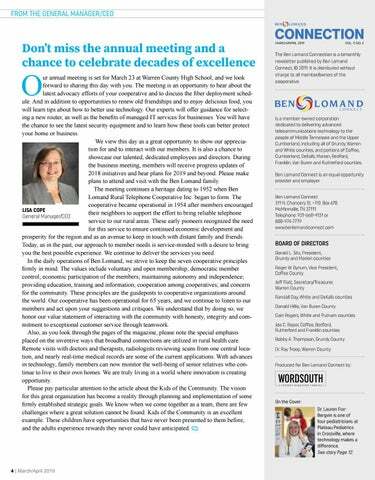 While all residents in the community should have access to a connection in the next few months, the weather has caused a few delays, says Lisa Cope, general manager and CEO at Ben Lomand Connect. Ben Lomand Connect CEO Lisa Cope speaks during the ribbon cutting for the Pocahontas Technology & Community Center. 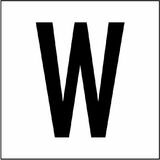 include Espy, Lumley Stand and Gnat Hill roads, west of Tennessee Highway 53. After the current grant’s work is complete, service will extend to Pocahontas Road east of Highway 53 thanks to money from a Tennessee Economic Development Broadband Accessibility Grant. bout this time every year, the gems of spring — Southerngrown onions — appear on grocery shelves, and they are certainly a long-awaited treat for onion lovers. Unlike those other onions that bring you to tears, these are so mild they’re considered tear-free. Many people love them so much they bite right into them like an apple. When people think of sweet onions, most envision Georgia’s Vidalias. But South Carolina Palmetto Sweets, which entered the market about a decade ago, are gaining ground. Dupre Percival is a caterer and restaurateur who is passionate about South Carolina products, including Palmetto Sweets. “We’re known for our foods,” he says of his home state. “Our grits. Our peaches. Our peanuts. And dishes like our Frogmore Stew. I add a lot of onions to that. When you think South Carolina, you think food.” Most Palmetto Sweets are grown in the state’s Piedmont region, where the weather is just a bit cooler and the soil, much like that across the border in Georgia’s Vidaliagrowing counties, is rich and loamy. But, Percival notes, soil changes from place to place. “You can have two fields of onions on one farm and they won’t taste the same,” he says. However, no matter the sweetness, they’re all good for cooking. CAROLINA SWEET ONION DIP This is a signature dish for Dupre Catering. 1 cup finely chopped sweet onions 1 cup mayonnaise (preferably Duke’s) 1 cup grated Parmesan cheese Paprika Pita chips Heat oven to 325 degrees. Combine onions, mayonnaise and cheese and place in baking dish. Lightly dust top with paprika and bake for 20-30 minutes or until bubbly and brown on top. Serve with pita chips. Tip: Add collard greens that have been cooked, mashed and very well-drained to this dip for a taste explosion. SWEET ONION TOMATO PIE Dupre Percival says using Duke’s mayonnaise and Sunbeam bread makes a big difference in the outcome. Heat oven to 375 degrees. Prepare cheese spread by combining cheese with mayonnaise, onion, salt and pepper. Grease a 9- by 12-inch casserole dish with butter, olive oil or cooking spray. Layer the bottom evenly with 7 slices of bread cut into medium-sized cubes. Create a layer of tomatoes by overlapping them in a single layer on top of the bread cubes. This usually can be done with 5 of the tomatoes making 4 rows. Season liberally with salt and pepper. Trim the crusts from the remaining slices of bread and place the slices over the top so that they completely cover the tomatoes. Spread the slices with the cheese spread. Cover well, but don’t be tempted to use too much cheese spread or the pie will be soggy. Arrange the remaining tomatoes in slices in the same manner as before. Then, season with salt and pepper. Dollop the rest of the cheese spread in rows across the top or in whatever design you want. Bake, uncovered, for 25 minutes or until the cheese mixture becomes golden brown. Makes about 15 servings as a side dish. Note: The pie can be dressed up by adding fresh herbs such as basil, oregano and marjoram to the cheese mixture. ROASTED BALSAMIC ONIONS Always a sweet way to enjoy the sweet onions of the South. 2 large sweet onions, peeled Coarse salt and coarsely ground pepper, to taste 4 tablespoons butter Good-quality balsamic vinegar Heat oven to 350 degrees. Butter a baking dish just large enough to hold the onions. Slice off the top and the bottom parts of the onions so they sit flat in the baking dish; cut the onions in half. Enjoy refreshments! • Win door prizes! FREE GIFT FOR EVERY CUSTOMER! Doors open at 11 a.m. | Meeting begins at 2 p.m. Warren County High School You and your family!